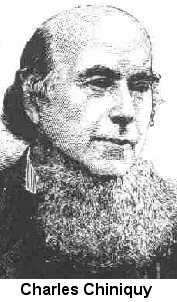 ARCHBISHOP JOHN HUGHES of New York sailed for Rome in the autumn of 1851, just after Congress had approved funds to enlarge the Capitol. Hughes had laid the cornerstone for St. Patrick’s Cathedral in Manhattan, and had helped the Jesuits establish Fordham University in Westchester. Now he was helping them decorate the Capitol’s interior. In Rome, Superior General John Roothaan introduced the Archbishop to Constantino Brumidi, an artist boasting an impressive list of credits. Brumidi had painted an acclaimed portrait of Pio Nono (which the Vatican still exhibits), an Immaculate Conception in the little Sanctuary of the Madonna dell’Archetto in Via San Marcello, and the restoration of three sixteenth- century frescoes in the Vatican Palace. Brumidi was good. General Roothaan had determined to make him America’s Michaelangelo. Archbishop Hughes let it be known that Brumidi would be welcome to paint some frescoes in churches of the New York bishopric. General Roothaan then went about making the Vatican’s artist acceptable to American egalitarianism. Vatican justice found the artist guilty in December 1851 and sentenced him to eighteen years in prison. Several weeks later the sentence was reduced to six years. And within two months, on March 20, Pio Nono himself quietly granted Brumidi an unconditional pardon. General Roothaan then placed his newly-created republican freedom fighter on a ship bound for America. Thomas Walter needed Constantino Brumidi. An edifice as important as the United States Capitol-like the palaces of Augustus and Nero, the Baths of Titus and Livia, the Loggia of Raphael at the Vatican-required the most noble and permanent interior decoration possible. Only fresco painting, in which pigments are mixed with wet mortar immediately before application to the surface, would suffice. And only Constantino Brumidi, of all the artists living in America, knew how to paint fresco. But the dome was not yet ready to be frescoed. So the artist was routed to the sunny, Italianate climate of Mexico City to enjoy life, to ponder his subject matter at a casual pace, to wait for the call. Two years later, on December 28, 1854, less than three weeks following Pio Nono’s decree of the doctrine of Immaculate Conception, Constantino Brumidi appeared in the office of Montgomery C. Meigs, Supervising Engineer of the Capitol extension project. The Capitol’s unpublished dossier on Brumidi relates that as the two men conversed in broken French, Brumidi struck Meigs as “a lively old man with a very red nose, either from Mexican suns or French brandies.” The immediate upshot of their conversation was a commission to paint a fresco covering an elliptical arch at one end of Meigs’ office in the Capitol. It was the first fresco ever painted in the United States, as well as Brumidi’s first in five years. The fresco celebrated the coming Civil War in terms of Roman history. According to the commission’s report it depicted “a senator, who points to Rome and appeals to Cincinnatus to come to the help of his country.” Cincinnatus, the fifth-century BC Roman dictator, was called to defend Rome twice, first from foreign invaders, then from his own common people. (civil war) Likewise, American heroes first defended their Rome against foreign British invaders, and were now about to be called to defend the same Rome against her own seceding states. Brumidi completed the Cincinnatus in March 1855. Meigs invited various Congressmen to behold it. They were impressed. 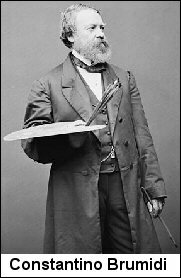 Thomas U. Walter was “much delighted.” On March 20, Jefferson Davis approved of the Cincinnatus and authorized Meigs to negotiate a salaried contract with Brumidi. Constantino Brumidi’s lifetime career spent decorating the Capitol began on a salary of $8.00 a day. His contract allowed him to accept other artistic projects but not to leave Washington. In November 1855 he began a canvas painting of the Blessed Virgin for St. Ignatius’ Jesuit church in Baltimore, but was not present for its December 4th installation, on the occasion of the Feast of the Immaculate Conception. Apotheosis – the act of placing a prince or other distinguished person among the heathen deities. This honor was often bestowed on illustrious men of Rome, and followed by the erection of temples, and the institution of sacrifices to the new deity. Walter responded ecstatically to the “Apotheosis,” writing the artist that “no picture in the world will at all compare with this in magnitude.” He praised the design before Worshipful Master and Commissioner of Buildings Benjamin French as “probably the grandest, and the most imposing that has ever been executed in the world.” French enthusiastically agreed, adding that the Secretary of Interior was also greatly impressed. Final approval of “Apotheosis” at a price of $40,000 came on March 11 , 1863, just as the Immaculate Virgin was being placed on her temporary pedestal on the Capitol’s east grounds. “Frustrating delays in manpower,” according to official histories, would hold the fresco in abeyance until December 1864. Counsel for the defendants objected to the Commission, arguing that the military had no jurisdiction over civilians, and therefore the proceeding was unconstitutional. The objection was overruled and the trial moved forward. Within seven weeks, the Commission (a two-thirds majority, not the unanimity required of a civilian jury) found four of the conspirators guilty. On July 7, 1865 they were hanged. was to cover up the religious element of that terrible drama. But this was carefully avoided throughout the trial. not a single one of the government men would discuss it with me except after I had given my word of honor that I would never mention their names. I saw, with a profound distress, that the influence of Rome was almost supreme in Washington. I could not find a single statesman who would dare to face that nefarious influence and fight it down. It is fact well established that the headquarters of the conspiracy was the house of a Roman Catholic family, of which Mrs. Mary E. Surratt was the head; and that all of its inmates, including a number of boarders, were devoted members of the Roman Catholic Church. This house was the meeting place, the council chamber, of Booth and his co-conspirators, including Mrs. Mary E. Surratt, and her son, John H. Surratt, who, next to Booth, were the most active members of the conspiracy. At the conspiracy trial, Father Wiget testified to Mary Elizabeth Surratt’s “good Christian character.” Even assuming her complicity in the assassination, Wiget as a Jesuit could truthfully say Surratt was a good Christian simply by reserving mentally (a) that by “Christian” he meant “Roman Catholic;” (b) that under the terms of the Directorium Inquisitorum (see Chapter 8), “Every individual may kill a heretic;” and (c) that President Lincoln was twice a heretic: for his Protestantism and for his having successfully defended an excommunicated priest. But Mary after all “kept the nest that hatched the egg,” as President Johnson put it, and was hanged. Conditional to her death sentence was a provision that a petition for mercy would be attached and sent to Johnson. By execution day, July 7, 1865, Surratt’s daughter Anna had heard nothing from the President. Distraught, she appeared at the White House to beg him for clemency. Two government men stood in her way. Preston King and Senator James Henry Lane denied her access to the President, who later declared he had never received any petition for mercy. The following November, Preston King drowned, his body laden with weights. In March, Senator Lane shot himself. (In the judgment of one modern investigator, “Some person or persons were apparently determined that Mary Surratt should not live.”) Shortly thereafter, the Supreme Court rendered a landmark decision that would have won all the conspirators a jury trial. Ex parte Milligan held that military courts have no jurisdiction over civilians. Milligan lent Mary Surratt’s death at the hands of Protestants an aura of tragedy and Catholic martyrdom. The next day, Rev. Conwell journeyed ten miles to the town of St. Cloud. As soon as he arrived, he asked the hotelier, Mr. Haworth, if he had heard any news of a presidential assassination. Mr. Haworth had heard nothing, as St. Cloud had neither railroad nor telegraph. On the following morning, April 16th, on his way to preach a sermon in church, Rev. Conwell was handed a copy of a telegram brought up by stagecoach from Anoka, Minnesota. The telegram announced that President Lincoln had been assassinated on Friday evening at about nine o’clock. positive evidence that these Jesuit Fathers, priests of Rome, engaged in preparing young men for the priesthood away out in the village of St. Joseph, in far off Minnesota, were in correspondence with their brethren in Washington City, and had been informed that the plan to assassinate the President had been matured, the agents for its accomplishment had been found, the time for its execution had been set, and so sure were they of its accomplishment, that they could announce it as already done, three or four hours before it had been consummated. The anticipation of its accomplishment so elated them that they could not refrain from passing it around ... as a piece of glorious news. The epicenter of “Apotheosis of Washington” is a solar orb, the Sun-God into which Augustus Caesar was said to have been absorbed when his body died. 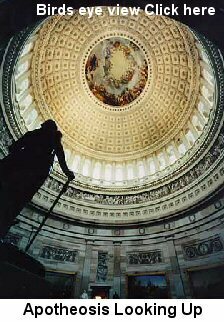 From the Capitol’s highest interior point Augustus radiates his golden light outward and downward to the next in the “line of Julius,” the deified George Washington. The god Washington occupies the judgment seat of heaven, sword of Justice firmly clasped in his left hand. Basking in the light of Augustus–Pontifex Maximus(meaning the"highest"of SUN Worship high priests) he rules “over far territories north and south of the zodiacal stars, the solar way.” Like his Caesarean forebears, Washington is God, Caesar,(Pontifex maximus) Father of his Country. On the right hand of the Father sits Minerva, holding the emblem of Roman totalitarianism, the fasces. Minerva, we recall, was the virgin goddess of the Sacred Heart–it was she who rescued the heart of the Son of God, and placed it with Jupiter in heaven. She was called “Minerva” when praised for her justice and wisdom. When praised for her beauty and love, Minerva was known as Venus, the Queen of Heaven. She and Venus were often identified with each other, just as statues of both were reconsecrated “Mary” through Roman Catholic missionary adaptation. Minerva’s most persistent role in ancient paganism was Dea Benigna, “The Mediatrix.” She heard the prayers of sinful mortals and passed them on to Jupiter, in the same way the Roman Mary is believed to pass Catholic prayers on to Christ. Completing the circular composition around the solarized Augustus are thirteen nubile goddesses. These are the original States. 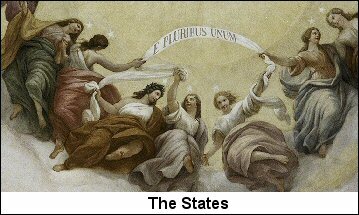 They dance weightlessly in space, supporting a white banner inscribed with the soul of the Bacchic Gospel, “E PLURIBUS UNUM.” Above the head of each State-goddess floats a magical white pentagram. Beneath all this celestial revelry, Brumidi painted more Roman gods mingling with American mortals. Here is Vulcan, the god of fire and craftsmanship, planting his foot on a cannon, while his workers prepare munitions and weapons of death and destruction. And over here Neptune rises with his trident from the sea in a horse-drawn scallop-shell chariot. And here the wise Mediatrix communicates with American scientists Benjamin Franklin, Samuel F. B. Morse, inventor of the Code, and Robert Fulton, inventor of the steamship. 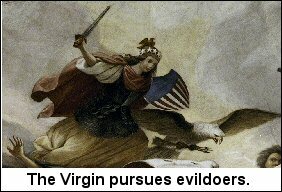 The eagle gliding behind Mary explains the otherwise inscrutable seal of the United States Justice Department, which contains a wingspread eagle surrounded by the motto “QUI PRO DOMINA JUSTITIA SEQUITUR” (“He who follows the Goddess Justice”). Persephone, or Minerva the Mediatrix, when judging the sinfully dead in Hades was called Justitia, or Justice. The “HE” of the Justice Department’s motto identifies the eagle, symbol of Rome. Rome follows the Goddess Justice – that is, the Immaculately Conceived Mother of God in her judicial capacity. A rainbow sweeps across the lower quadrant of the Dome of the Sky from Benjamin Franklin to a young boy wearing a Smurf-cap and a toga. The boy attends a goddess who reclines on a large horse-drawn reaper. She is Persephone’s mother Ceres, who was reconsecrated by early missionary adaptation as Anna, mother of the Virgin Mary. 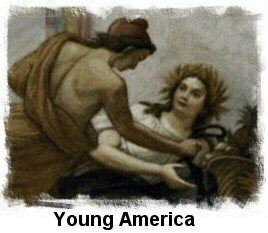 The golden boy is officially designated “Young America.” Although Brumidi has hidden the boy’s face from us, he deserves our careful scrutiny for one very important reason. Bearing the name “America,” he is the only element in the sacred national iconography that defines the character of the American person as perceived by government. Young America’s Smurf-cap is a style of headgear known as the “Phrygian cap.” Phrygia was a district in the Kingdom of Per gamum. We remember Pergamum. 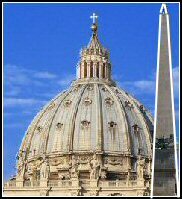 It was the middle point in the transfer of Babylonian religion westward to Rome. Phrygia is a Greek word meaning “freemen” (our English word “free” comes from the first syllable, “phry-”). Phrygian caps were given to freed Roman slaves to indicate their new liberated status. Roman law regards liberty as a conditional status. Once granted by a patron, it could be revoked at any time for cause. Phrygian-cap freedom, then, means liberty (freed Roman slaves, by the way, were called “liberti”) to please Caesar. We remember from Chapter 8 how Ignatius described such freedom in Section 353.1 of his Exercises: “We must put aside all judgment of our own, and keep the mind ever ready and prompt to obey in all things the hierarchical Church.” Of course, those liberti bold enough to protest what their superiors commanded lost their freedom, no matter how lucid and reasonable their own judgment might have been. They were reverted to slavery. Since the advent of the Febronian State Church, the reversion of protestant liberti, or Protestants, to slavery has been so methodically insidious that it’s hardly noticeable. The shackles are psychological, humanely fitted by increasing varieties of spiritual exercise. Like Aeneas, Anchises, Julius Ascanius and their Trojan followers, most Americans are indeed Phrygiancap freemen, free to sacrifice their individuality to the greater glory of Rome. The Black Obelisk of Calah, which stands in the Babylonian-Assyrian Wing of the British Museum, records the great accomplishments of the ninth-century BC god-king Shalmaneser II. In a scene depicting various monarchs paying obeisance to Babylon, we see one monarch kneeling before Shalmaneser, worshiping him. Shalmaneser in turn offers a sacrifice to an eight-pointed star set within a bird’s wings and tail-feathers. Inscriptions identify this kneeling monarch as King Jehu of Israel. Remarkably, according to the New Catholic Encyclopedia, Jehu’s likeness here is the only known contemporaneously-rendered portrait of a biblical personage. More remarkably, Jehu is wearing the Phrygian cap. Like BrumidiYoung America, Jehu’s liberty is subject to the mood of his god-king. 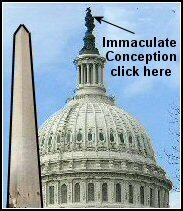 The Bible confirms the testimony of the Black Obelisk. At II Kings 10:31 we read: “Jehu took no heed to walk in the law of the Lord God of Israel with all his heart.” Scripture further tells us that THE FREEDOM CAP Jehu submitting to Shalmaneser Jehu worshiped the golden calf, a sacred Babylonian icon made fashionable in tenth-century-BC Israel by Jehu’s predecessor, Jeroboam. Jeroboam renounced “the law of the Lord G o d of Israel” and instituted... democracy. Democracy opened the Israelite priesthood, originally appointed by Yahweh exclusively to the family of Levi, to all applicants. Consequently, Yahweh’s priesthood was infiltrated by non-believers and foreign sympathizers. They prepared the way for Jehu to make of himself a Phrygian freeman, obligated to concur with obedience of the understanding in all things which his superior, Shalmaneser II, commanded – exactly as the Black Obelisk explains in lucid visual terms. As a direct result of Jehu’s departure from the God of Israel, the Israelite nation began falling apart. It was ultimately destroyed by Caesarean Rome, the legitimate heir to Shalmaneser’s Babylonian authority as it passed down through Pergamum. Running throughout this cosmic Battle of the Faiths is a highly refined cabalah involving the concept of “golden calf.” The word “calf” in Hebrew, the language of Jehu and Jeroboam, is MCS, pronounced “eagle.” Whereas Jehu gave his people Shalmaneser’s golden MCSi to worship, the Church Militant has trained the American public to worship Rome’s golden eagle, which surmounts every flagpole. Could it be that if we show respect, affection, or loyalty toward the national eagle we create the presumption of worshiping the golden calf, and so alienate ourselves from the God of the Bible and in the vacuum find ourselves under the rule of the Church Militant? responsible to the amount of $1,400,000 upon his own notes, which were promptly paid at maturity. This enabled the American army to give the finishing stroke to the revolution, and triumph, in victory complete, over a proud and merciless foe. So goes a historian’s version of how Robert Morris saved America. The official version is revealed in Constantino Brumidi’s “Apotheosis of Washington.” Here we see Superintendent Morris gazing up from his accounts ledger at yet another Roman deity. We recognize the deity from the familiar caduceus in his right hand, from the winged sandal he’s thrust to within kissing distance of Morris’ lips, and from the shadowy bag of gold he tantalizingly dangles in Morris’ face. The deity is Mercury, the Psychopomp, the Trickster, the patron deity of commerce, deceivers, and thieves. Mercury, the brilliant, lovable Pied-Piper deity who deceives the souls of sinful humanity into following him exuberantly down into the oblivion of Hades. 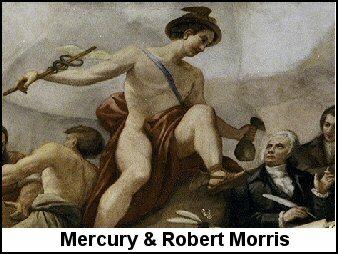 Just as Sebastiano Ricci’s painting subtly established Mercury as the guiding spirit of modern Roman Catholicism, Brumidi’s painting acknowledges the same deity’s ascendancy over the fulfillment of the American Revolution. Amazing stuff, these pictures. And like so many of the testimonies presented in this book–the supremacy of the Church Militant, the publication of Sun-Tzuan strategies in a western language, the names, the numbers, the dates, the locus and layout of the federal city, the architecture, the statuary, the monuments, the emblems, the frescoes, the ceremonies–they come not from the Trickster’s victims, but from the Trickster himself. It’s as if the point of the trick is to warn the victim beforehand, in words and pictures, that he or she is about to be tricked. A con is much sweeter when the mark actually consents to the con. That way, the Trickster’s conscience is clear. 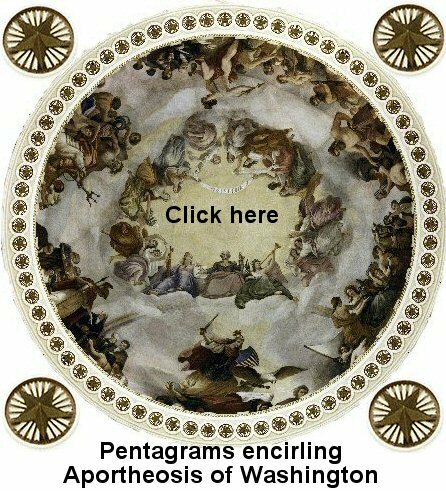 CONSTANTINO Brumidi continued decorating the Dome of the Great Sky well into his seventies. In 1879, at the age of 74, while painting “Penn’s Treaty with the Indians” on the Rotunda frieze, he slipped from a scaffold. Dangling fifty-eight feet from the marble floor, he held on until help came. He escaped a deadly fall. But the shock of the experience killed him a few months later.